Happy spring to all of you! Weather is on the verge of becoming colder up as sun is going to sleep a little earlier now everyday and the good news is now we can go out and enjoy walks, sit outside savor sunlight and compensate for all the vitamin D we missed by running away from the sun in the hot seasons!And while we are thinking of having a picnic in the sun, we have something just as healthy while being a tasty accompaniment to the aforementioned excursions. Presenting before you this amazing sweet- Til Bhugga, which is healthy as well as tasty. It includes sesame seeds (til) endowed with vitamins, minerals, natural oils and organic compound which consists of calcium, iron, magnesium, phosphorous, fibres and so on. 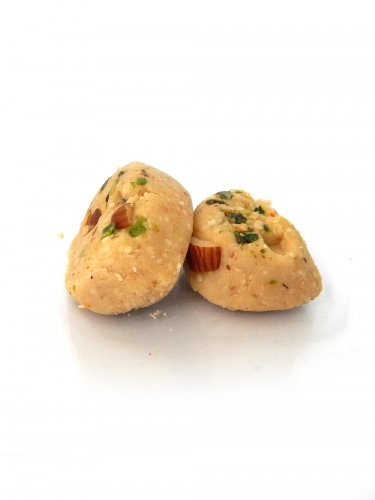 Besides this khoya, healthy nuts and powered sugar are also added to give delicious and yummy look. ISHAR SWEETS which is popular for making Til Bhugga, goes to great lengths to ensure that each piece of this sweet is so yummy that you cannot resist coming back for more! Order it now on FoodFeasta.com and enjoy with your family.